Why Turks and Caicos Islands? – Meridian Trust Ltd.
Why Turks and Caicos ? Why Turks and Caicos Islands? The Turks and Caicos Islands (the Islands, the TCI) are an intentional “offshore finance centre” specifically created by Britain following a UK government-sponsored study in 1970. Unlike some of the other Caribbean islands, such as Bermuda or the Bahamas, which just grew into tax havens, the Government of the TCI, with the encouragement and assistance of the British Government, set out to create “the best offshore finance centre in the world”. They subsequently enacted legislative measures to implement the infrastructure necessary to support this aim, including specifically crafted laws on confidentiality, banking, insurance, trusts, companies and limited partnerships. No direct taxes – there are no taxes on personal or corporate income, profits or assets. There are no capital gains taxes, nor withholding taxes. No tax treaties – there are no tax treaties with other countries, thus protecting privacy from foreign tax authorities. The Turks & Caicos legal system is very similar to the legal systems of Britain, Canada and the United States. The TCI have a written constitution which, similar to the constitutions of Canada and the United States, includes provisions for the protection of fundamental rights and freedoms of individuals in the TCI. Most legislation is derived from “Ordinances” passed by the government in power, while some are directly extended to the TCI by Britain. For real estate transactions, the TCI is fortunate to have had in place since 1971 the Torrens System of land registration developed in Australia and New Zealand and applied in parts of Canada. The Torrens or Land Titles System provides an efficient and precise method of ascertaining title to property as well property boundaries. Any person incurring damage as a result of an error in the government land register is indemnified by the TCI government for such damage. The court system is three-tiered. The Magistrate’s and Supreme Court both sit in the TCI. The Court of Appeal sits in Nassau (in the Bahamas), and the final appellate court is the Privy Council, which sits in England. There are no foreign exchange controls in the Islands which means investors and workers are free to move money in and out of the country without restriction. The TCI are an archipelago comprising over 40 islands which are split into two main groups: the Turks to the east and the Caicos to the west. They are located at the southern end of the Bahamas chain, 575 miles southeast of Miami and 120 miles east of Cuba. There are eight major populated islands and numerous smaller cays. The total area of the major islands is approximately 190 square miles and their main geographic attractions are 230 miles of white-sand beaches, a magnificent coral reef system and crystalline turquoise blue waters. 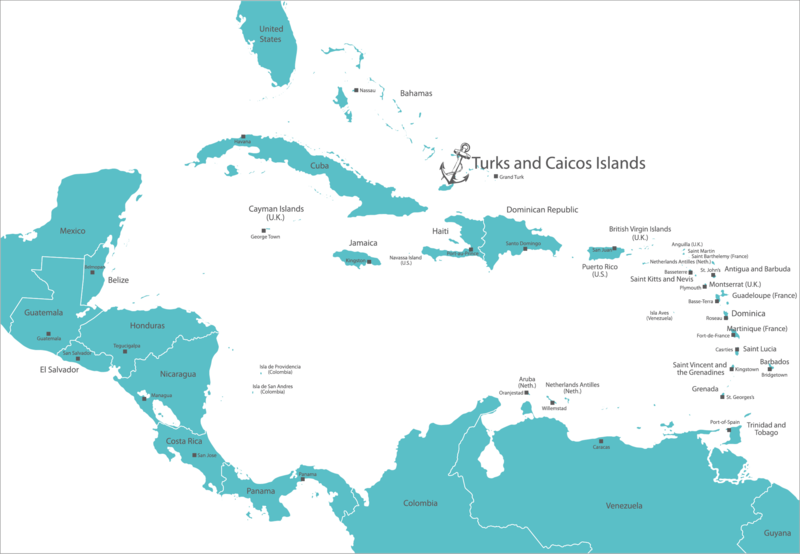 The most populated islands are Providenciales (known locally as “Provo”) at the north-western end and Grand Turk, located at the southern end of the chain. Provo is the location of the majority of the tourist and commercial activity, and is the fastest developing island. Cockburn Town, Grand Turk is the capital. An extensive flight schedule with Europe and North America, world class telecommunication services, a warm climate and the absence of direct taxes have led to a steady stream of high net worth individuals making the Islands their home. Many have taken permanent residence in this low tax jurisdiction. This has resulted in a new flow of investment capital fueling an expansion in the tourism and construction industries. Meridian Trust Company Ltd would be happy to advise high net worth individuals seeking either residency or investment opportunities. Official currency is the U.S. dollar. Meridian Trust Company Ltd is a Turks & Caicos Islands corporation licensed as a professional trustee under the Trustee Ordinance (1992). Established in 1996, Our Services range from Company Formation to the administration of complex trust and fund structures. © 2018 Meridian Trust Ltd. Turks and Caicos Islands.